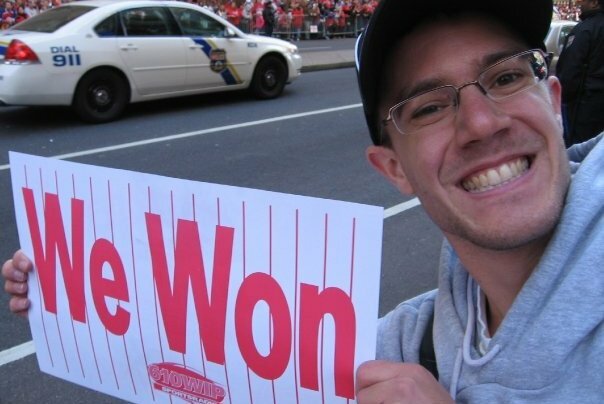 PhillyVoice reporter John Kopp watched the Phillies' World Series parade near Broad and Walnut streets in 2008. He'll be back to the same spot for the Eagles' Super Bowl parade. On the day the Phillies paraded down Broad Street in October 2008, I woke up early – at least for a college kid – and hustled into Center City, eager to claim a prime viewpoint for the celebration. The Phillies had won the World Series two nights before, bringing Philadelphia its first championship in 25 years. I definitely wasn't the first person to arrive at Broad and Walnut streets by 8 a.m., but the crowd there wasn't huge yet. Equipped with a digital camera and a championship hat, I staked out a spot behind the metal barriers along South Broad Street, not far from the Union League. Nearly 10 years later, I'll begin Thursday around the same spot, interviewing fans who have waited decades to watch the Eagles parade through Philadelphia as Super Bowl champions. Given the decade between the two championships, it seemed an appropriate time to consider just how much has changed since a Philly team last celebrated a championship with the city. Unsurprisingly, the biggest changes involve technology. I arrived to the Phillies parade equipped with a flip phone and a digital camera – and that was the norm. Though the first iPhone had been released nearly 18 months earlier, smartphones had yet to soar in popularity. At the time, the Motorola RAZR was enjoying its moment as the most popular phone on the market. As Pat Burrell – riding on a horse-drawn, Budweiser carriage – led the procession south on Broad Street, many in the crowd hoisted digital cameras into the air, hoping to capture a memorable picture. Indeed, many of the Phillies also carried them. Digital camera sales had nearly hit their peak in 2008, but don't expect to see too many on Thursday. Smartphones and selfie-sticks have long since diminished their popularity. (At time of victory) Are You Lonesome,"
News of the Day "To Kill A Mockingbird"
Without smartphones, most people did not have access to social media during the parade, so there was no steady stream of photographs, videos or status updates. In fact, social media was somewhat in its infancy. Facebook only had expanded beyond students to the entire public in 2006. Twitter was two years old, but to most of the country, the hashtag was still known as the pound sign. And Instagram and Snapchat – among the most popular social media apps today – did not exist. Of course, many Phillies fans opted to simply watch the celebrations on television. Believe it or not, some of those fans did so with analog TVs. Broadcasters finally switched off their analog signals on June 12, 2009. For the fans that made the trek into Center City, it wasn't without challenges. SEPTA was a mess that day, stranding untold numbers of fans at suburban train stops along its Regional Rail system, its eight lines still known then as the R1 to R8. The smart cards that SEPTA passengers now use to access subways, trolleys and buses were available in other cities back in 2008. Philly was still using tokens, but had announced its intention to develop a smart card system in November 2007. The transit authority finally began rolling it out 10 years later. When Phillies fans overwhelmed the subway system in South Philly, following the team's ceremony at Citizens Bank Park, there were few alternatives to get home. Uber and Lyft were not operating in 2008. And the Indego bike share program was years away. It remains to be seen whether SEPTA's system will run more efficiently for the Super Bowl celebration. But for anyone stranded after the Eagles parade, Philly has a whole lot more to offer than it did 10 years ago. The city's restaurant scene, for one, is far better. Both Parc and Zahav – still among the city's finest restaurants – debuted in 2008. Likewise, Butcher and Singer opened just days before the parade. But the fine dining scene on East Passyunk had not yet exploded, nor had the bar scene along Frankford Avenue in Fishtown. Additionally, all sorts of attractions have debuted since the Phillies won it all. Race Street Pier and Spruce Street Harbor Park are now hotspots along the Delaware River. The Barnes Museum relocated onto the Benjamin Franklin Parkway, which underwent months and months of construction. Dilworth Plaza and Love Park got modern redesigns. The Schuylkill Banks boardwalk offers scenic views along the Schuylkill River. And the skyline – which had added the Comcast Center in 2008 – is fuller and taller than ever. From a sports standpoint, the Phillies' World Series run took the city somewhat by surprise – not unlike the Eagles' unexpected Super Bowl victory. The Phillies had broken a 14-year playoff drought in 2007, but spent much of the 2008 season again chasing the New York Mets. As they blew past the Brewers, and then the Dodgers, fans grew more confident that it was finally their time to celebrate a title. Across the street, the Eagles made one last run to the NFC Championship game under Andy Reid following a strange – and dramatic – season. Just several weeks after the Phillies' parade, the Eagles played the Cincinnati Bengals to a 13-13 tie. Afterward, Donovan McNabb claimed he didn't know a game could end in a tie. And one week later, Reid pulled him from a game against the Baltimore Ravens, inserting Kevin Kolb and sparking a quarterback controversy. But McNabb and the Eagles – in Brian Dawkins' last season with the team – won four of their final five games to make the playoffs. But their win against the New York Giants in the Divisional Round marked their last playoff victory until this year. Meanwhile, the 76ers remained mired in mediocrity with a team that included Samuel Dalembert, Andre Iguodala and Thaddeus Young. And the Flyers followed a surprising run to the conference finals by losing their first six games of the 2008-09 season. Now, it's finally the Eagles' turn to parade through Philadelphia. Instead of Phillies' red, the city will be a sea of Eagles green. Again, I'll wake up early and trek to the same Center City location where I stood for the Phillies parade. This time, I'll be equipped with a smartphone and required to post updates to social media – journalistic tasks that are now routine. But even South Broad Street will look slightly different. The A.C. Moore Arts and Crafts store at Broad and Chestnut – the one that was vandalized after tens of thousands of Eagles fans rushed Broad Street in the following the Super Bowl – was an FYE in 2008. With all the streaming services available, few people purchase CDs anymore – and they were outdated at the time. Similarly, the Walgreens across the street once housed a Borders bookstore. And the Wawa at Broad and Walnut streets – which thousands of people pack each day – once housed Robinson Luggage. Indeed, this celebration seems different all the way around. "Without continual growth and progress, such words as improvement, achievement, and success have no meaning," Benjamin Franklin said. Truer words could not be spoken on the day Philadelphia honors its Super Bowl champions.